this is a sketch i did for one of my favorite clients. she actually commissioned a tattoo design from me last year, and liked it enough to actually get it on her body (on her ankle, i think)! 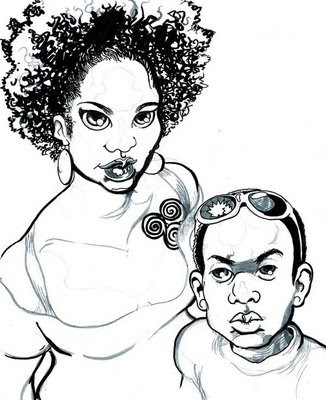 anyways, at my last show, she bought a copy of my Obama print and commissioned this sketch of herself and her son. she's always cool and very laid back about giving me time to complete her pieces as i'm working on other things and being a family man and all that, so here's a big hearty shout out to the fabulous Ms. Gooden! okay, so they have tons and tons of contests on DeviantArt.com. for most of them, there's no prizes, just art for it's own sake. 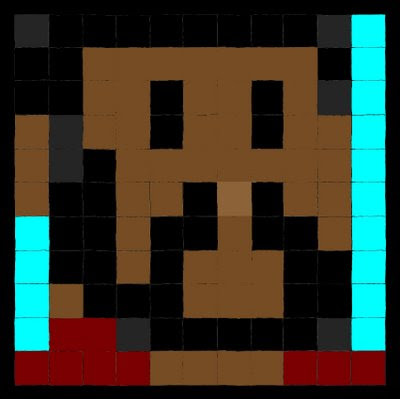 i am so busy that i rarely do them, but i couldn't resist the Pixel Art Portrait contest that required making a self-portrait by filling in the squares on a grid template they provided. this only took me a few minutes, but i really enjoyed doing it. design for the "ghettoManga Award" Trophy (click to enlarge). "Cupid" is the name of the ghettoManga Mascot. i'm actually working on some comic book stories for this character waaaay on the back burner... for reference i used this photo by A Blind Vision Photography. her work features EXACTLY the kind of women i like to draw, so you'll pro'lly see me ref'ing her stuff a lot! hopefully, i'll get to actually make these trophies eventually! i already have my eye on the sculptor... we'll see! buy a print of the image here. 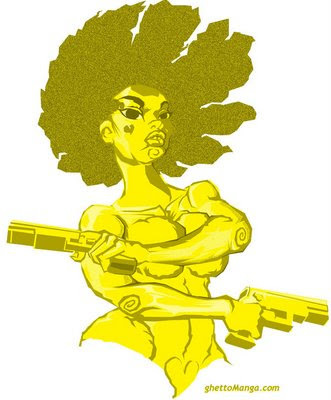 Props to my good friend Serena Wills, a published poet and prototypical cool sista who posted a great piece called His Voice on her blog Divine Wryte. go check her out, and let her know i said so!